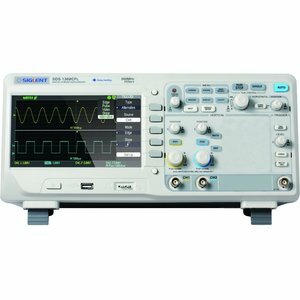 SIGLENT SDS1072CFL Digital Oscilloscope is a compact desktop dual-channel digital oscilloscope with a 70 MHz bandwidth. 7-inch TFT color liquid-crystal display of the oscilloscope ensures bright and vivid waveform representation and backlit buttons ensure user comfort. 24 K memory allows storing up to 20 waveforms and 20 setups. SIGLENT SDS1072CFL has a multi-language user interface and online help. SIGLENT SDS1072CFL Digital Oscilloscope is a good choice for industrial control and measurements, R&D, electronic circuit design and testing and all other applications involving testing and troubleshooting, as well as education and training. 2 channels + 1 external triggering channel. Channels 2 + 1 ext. ch. Download SIGLENT SDS1072CFL Data Sheet.